Rebirth: An ancient culture and philosophy revisited; rediscovered; revitalised; readdressed and remade. Rebirth, curated by Lorraine Cooke, is an exhibition of Contemporary Japanese Art inspired by Ancient Jomon culture and Japanese aesthetic, in collaboration with the Unearthed exhibition at the Sainsbury Centre for Visual Arts. The Rebirth exhibition features artworks by Sahoko Aki, Megumi Baba, Shaun Caton, Veronica Grassi, Jazz Green, Tsunaki Kuwashima, Barbara Leaney and Keika Sako. 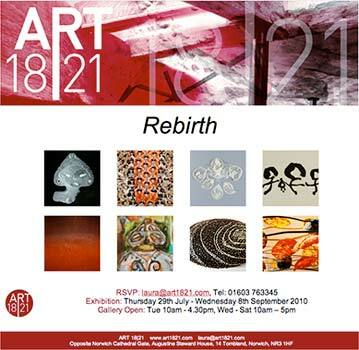 Rebirth, the exhibition, at gallery Art 1821, runs from 29th July to 8 September 2010. 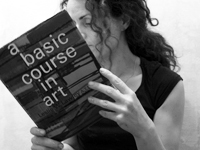 The gallery Art 1821 has a strong curatorial ethos and shows contemporary art by established and emerging artists. Together with exhibitions of new work, the gallery has works for sale by established artists from previous generations. Works by Piranesi, Fernand Leger, Prunella Clough, William Scott and Jamini Roy sit alongside works by established living artists such as Maurice Cockerill, Eric Fischl, Laxma Goud and Colin Self. i like the linking curatorial concepts behind unearthed and rebirth – as something re-discovered, re-visited, re-contextualised, re-vitalised… i have three large paintings in this exhibition. on: Wednesday 21 July 2010 by jazzgreen.